Always feel free to refer the MS article to get more knowledge on this which has described the roles with relevant images and tables. Let us consider one of the scenario described above. The growth of the your company has surpassed beyond your expectations and obviously this will lead to larger network structure and networking devices. When the company has started as a small business with 100 PCs a few years ago, the 254 IP addresses a Class C subnet offered seemed more than enough for a long time. But now it's a different story. The company growth obviously leads to short of IP addresses and you need to get this resolved immediately. So what are the considerations here? Making another physical LAN(and thus another subnet)but that means you need to buy another router or another DHCP server but does that really required as it will increase the administrative tasks and expenses? Another possibility is changing to another IP address class, may be class B or class A which will provide you with more addresses but again not a very attractive one. This time you'll have to justify purchasing this address range from your ISP and then face the prospect of migrating from the existing address range (scope) to the new one. So here you can consider the creating superscope and over come the difficulties without much administrative headache and expenses. 1. Open DHCP console from administrative tools-> DHCP. 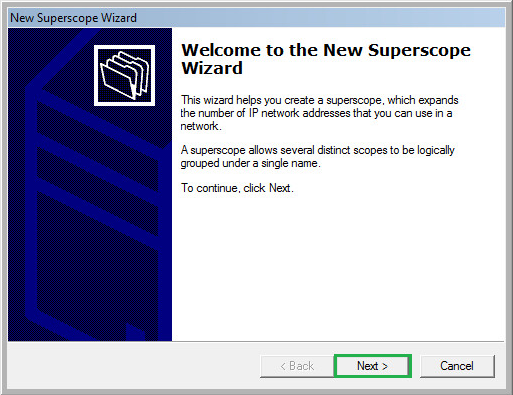 Expand the server name and right click on IPV4-> New Superscope. 2. Now the welcome windows will appear and click Next to start the configuration. 3. 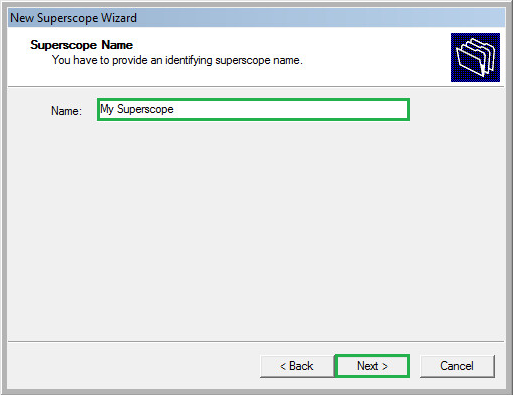 Specify the name that you would like to assign for super scope and click Next. 4. 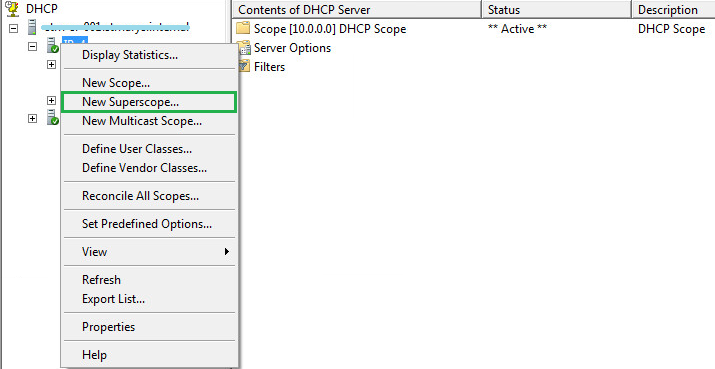 Now it will automatically detect the presently available scopes in your DHCP server and you need to select the scope that you would make under superscope. Here I have two scopes and I want to set super scope only for one scope. Select the scope which you want and click Next. 5. Click Finish to create the superscope and once it is created you will notice that particular scope will be listed under the super scope that we defined. That completes the super scope configuration on server. 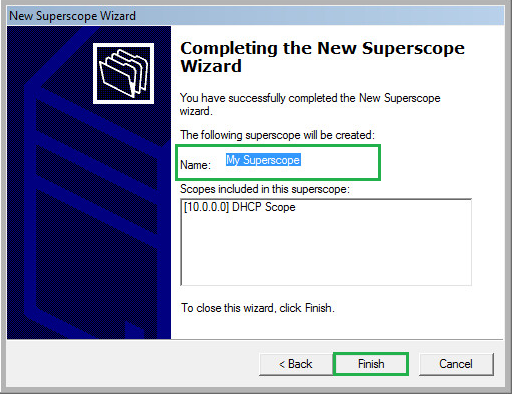 You can either create new scope under the new super scope by selecting the newly created super scope and select New scope. This will get you through the creation of new scopes in DHCP and completion of the same will result in adding the new scope under Super scope. Let me notify you once more thing. Once the super set is configured as above then we can say the network is multinets as described earlier. If you wish to add any of the existing scopes to super scope, just right click the scope and you will have the option Add to super scope. Select the super scope name that you would like to add and click OK. Now you will notice that the scope is listed undersuper scope that you selected. The same way can be followed to remove a scope from Superscope. From the superscope select the scope that you would like to remove from super scope and you will have the option Remove from Superscope. 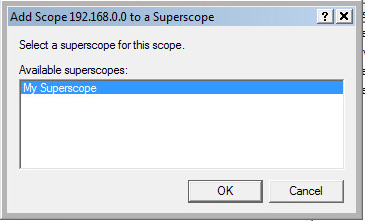 Confirm the same by selecting Yes and the scope will be removed from superscope. So that’s it the configuration of superscope and feel free to post your queries.